I feel like Sam I Am in Green Eggs and Ham, do you like tourteau de chèvre? But instead of saying, I do not like tourteau de chèvre, I would say right away, yes I do Sam I Am, I like tourteau de chèvre and I would eat it in a boat, with a goat, on a plane, in a house and I would serve this tourteau de chèvre for dessert with fresh berries and a drizzle of honey on the side as Dorie suggests. I would also serve it with tea or coffee in the afternoon, or as an appetizer with a glass of chilled white wine or rosé. I would not run away from a cheese torte with goat cheese because although it might sound different, it is wonderful and delicious. It looks like cheesecake but it’s lighter in texture, drier and not as sweet. How can you miss starting with these ingredients, a roll of soft goat cheese, eggs, sugar, cognac and a scraped vanilla bean baked in a pastry. Easily cut into wedges that you can eat of of your hand. My husband just walked in the kitchen and snagged a piece, yum! I think he likes it best for an after work snack. But, he wants another piece after dinner. Me too! I like my routine of making and posting a recipe from Around My French Table by Dorie Greenspan every week. 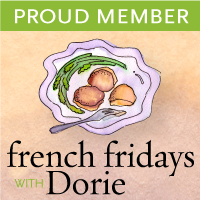 Please check out the other posts by fabulous Doristas here at French Fridays with Dorie. 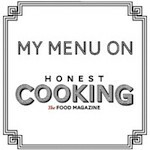 Consider picking up my new favorite cookbook, Around My French Table and cooking along with the group. I’m not supposed to give the recipe here, another reason to pick up the book. Your cake looks so perfect and delicate. Amazing photos and post! Hi Patty! This is another delicious creation. I know I would like this though my chevre-loathing husband wont' even try it, LOL! I can see making this for a party definitely. It's simple, yet elegant. Dorie Greenspan doesn't disappoint and you always do her recipes justice. Your cake looks fabulous! I love your reference to Dr. Seuss! I use to read it to my children and now I get to read it to my grands!! Great photos! Happy week-end! And Dr. Seuss totally rocks! I would eat it on a boat while holding a goat. Good thing I didn't make this one or I would have had to eaten all myself. This looks gorgeous as always. I love chevre but I can't pronounce the name of this dish. Is that bad?? haha. I've made your banana chocolate cake recently and this pretty dish is going to tempt me again! Well, I have to buy Dorie's book first! Beautifully done, Patty! And, great photos! Your cake looks great … and I love your plates, too. Just darling. Good goat, quel beau torteau! My mom was “ohmygodding” in the background as I showed her your Seussical work of art. Mmmmm! Patty-Love the way your chevre cheesecake turned out. So perfect, and totally different from the sweet cheesecakes. You're right, a chilled glass of nice white wine, or rose would be perfect with a slice of this yuminess…now, could you please pass a slice my way? Two things: I shipped the cookies out yesterday to you, and also I have an award for you to pick up at my blog. You'll find your name on the linked list. Well deserved award, Congratulations! Your cake looks delcious. I love the way you connected this to Sam I Am! He's an old friend to everyone. I've never met a goat cheese I didn't like. one recipe, we only had half the guilty feeling. Great photos. Patty, this torte turned out beautifully! You can tell by the awesome photos that it is airy and creamy. Love it. Your cake looks amazing! I wasn't so lucky in the looks department, but it did taste really good. Your torteau looks very handsome – I would love a slicecwith a glass of that lovely looking wine I can see in the background. I love how this is like cheesecake except lighter, less sweet and drier. This is a definite winner with me. This looks and sounds delicious. Hope you had a most lovely Mother's Day at brunch with your whole family, Patty! Beautiful cheesecake, it sounds just perfect with a cup of coffee. I just love your photographs! And I must agree with you. I'd eat it in a boat, maybe not with a goat, as I have been rammed by a goat once and I'd rather stay far away… but I would eat tourteau de chevre here and there and everywhere…. Patty, that is GORGEOUS! All your food turns out so lovely. I just might have to get Dorie's book for this one. This is one of the recipes that I bookmarked from Dorie's book…now I know I have to make it, yours looks fantastic! Gorgeous pictures, Patty! Yes, I want this with HONEY, NOW! We have some divine local honey made from tropical flowers (lychee?!) that I think would be wonderful with this. I'll tell you what, I'll send you a few jars and you send me this cheesecake, ok? Sound fair? no? I might have to get this darn cookbook then! All I can say is just WOW! I could even eat it for breakfast, I'm so bad Patty your photos look fantastic. The last one makes me want to grab that fork and dig in. May I have the beaded cake plate please? no? ok. But it all looks so wonderful as usual! Great job. I will certainly make this again and again. I'm so glad I didn't let it get by me. I could eat this in a boat, with a goat, on a plane, in a house, too Totally scrumptious and gorgeous photos as always! Beautiful! We loved this one too.